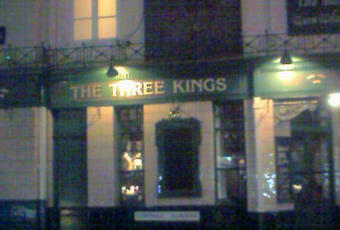 The Three Kings was my final stop of the night in Twickenham, before heading to an old favourite (the Sussex Arms). Of the 5 new places I'd visited, this was the best. The interior of this corner pub was cosy and a quiz was in full progress. Fuller's London Pride is the regular ale. Guests were Purity Pure Gold & Twickenham Naked Ladies. None of these were really my kind of beers. But, the Pure Gold was in good condition. 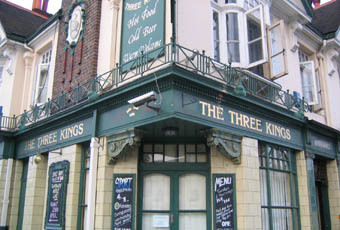 A nice comfortable pub considering it's right on the main drag. Must be popular at weekends. Worth a visit. I think I'd happily go back here if the manager would change the lightbulbs from 200w to 50w. Seriously, at the risk of sounding photosensitive this pub is waaay overlit. 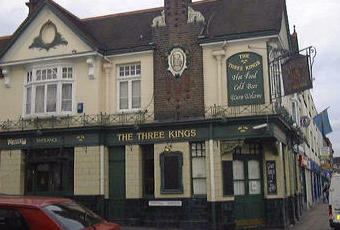 my wife and I and friends have also eaten here but its just a nice easy-feel pub where you are "recognised". Nice little pub.Decent pint of ale (can't remember what was on sorry) and friendly Manager who brought out roasties for the bar as in days of yore. Think will only get better as it beds in.